The AlphaJET utilizes the new Memjet DuraLink ink, modules and print heads for CMYK color impressions with 1600 dpi resolution. The White and Clear varnish inks take advantage of UV inkjet technology for a revolutionary best-of-breed convergence of digital printing methods. 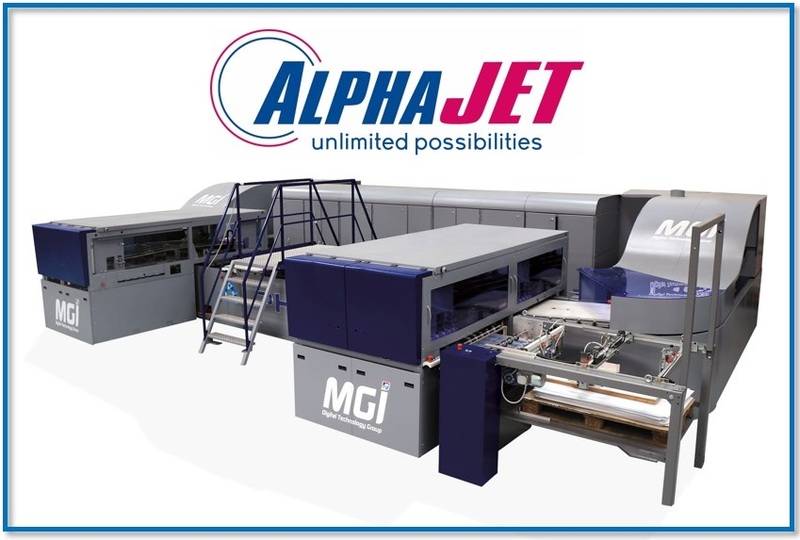 This powerful array of high-speed ink deposition processes allows the AlphaJET to both print and embellish corrugated flute board, paper, plastic and synthetic substrates at 1,800 B1 sheets (70.7x100cm/28x40”) per hour. The AlphaJET also has extraordinarily versatile substrate management capabilities for folding carton materials, corrugated flute board and other specialty stocks and rigid materials such as wood, metal and glass. It features a unique, circular transport carousel with an intelligent tray feeding system for multi-directional ink application to optimize print quality on a very wide range of substrates. The motorized electro-magnetic conveyer rails and intelligent AIS Smartscanner software provides accurate and secure print registration with an unprecedented precision tolerance of only 5 microns (.005mm) on each piece. In addition to the AlphaJET, MGI will be exhibiting the award-winningJETvarnish 3D Evolution B1 sheet-fed and JETvarnish 3D Web roll-fed digital enhancement presses at the All4Pack Exhibition (Hall 6 Booth L148). MGI’s Global Partner, Konica Minolta (Booth L151) will be demonstrating the dynamic flexibility of their AccurioLabel 190 digital press. MGI’s German engineering and manufacturing subsidiary,KÖRA-PACKMAT (Booth L121), will also be presenting their packaging, transport and finishing solutions.